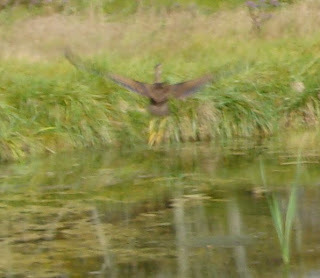 Look, I know it's a completely rubbish photograph that could be portraying absolutely any large brown bird with long yellow legs, but you'll have to take my word for it that it's an American bittern. We've been seeing this bird around the pond all summer but it flies off as soon as we approach, making it difficult to identify (for novice bird-watchers like us, anyway). This is the best picture I've been able to get and it was only today that I finally worked out what the bird is. My Birds of Ontario book says that it is "uncommon or even rare to actually see one", so I'm particularly thrilled to have finally identified it and taken this photo today, even if it is rubbish. I'm glad you posted it. We can start an "I know it's lousy but I'm posting it anyway" club. People have to submit their worst photos to join. And the great post title makes up for it. Your title more than makes up for the shot. I posted a Where's Waldo pair of goldfinches shot - everytime I look at it I have to relocate where the birds are - but, I still remember how excited I was to see the pair chowing down in my garden.